Today is the first official day of summer! Yippee! Now that the weather is FINALLY starting to get nicer here in Ontario I have been trying to find ways to keep Emmett busy outdoors. Not only is the fresh air great for him but I find he sleeps considerably better at night when he has spent a good portion of the day outdoors. Of course, like any new parent, I have some major concerns about our outdoor time with my 6 month old! In Ontario you just never know! In early summer morning and evening can be cool, requiring pants, sweaters and jackets! Yet during the daytime you need to sit around in your underwear you are so hot! Emmett is a pro at wearing just his underpants...or diaper in his case! So we dress accordingly! I usually throw an extra bag of clothes in the car (mostly in case of a blowout) but also in case the weather changes. We also have a couple of blankets in there too. On really hot days I always worry about his temperature. Especially when he is in the stroller. Fortunately Emmett is old enough now that we can give him sips of water to help stay hydrated. 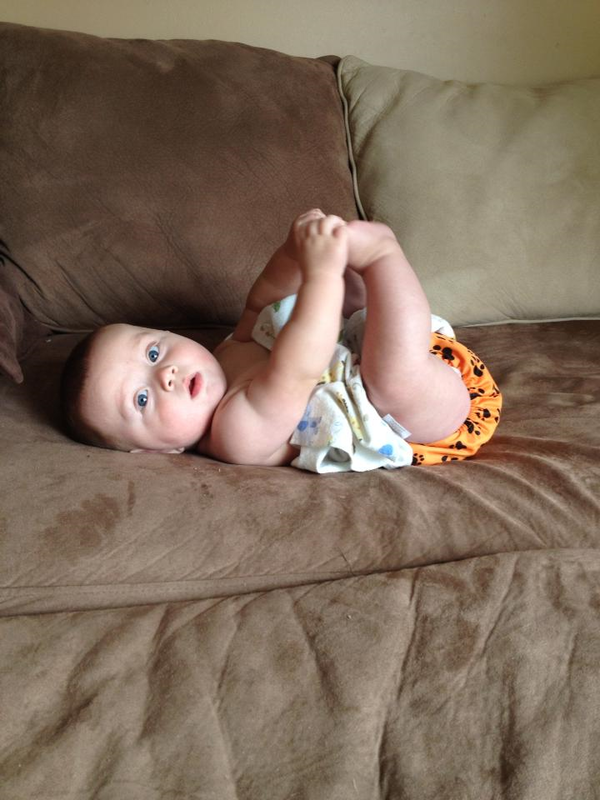 When we went to Florida in February and March Emmett wasn't even three months old. Water wasn't an option yet. We made sure to offer him extra breast milk/formula often to keep hydrated. We also spent a lot of time in the shade. We used the pool to cool off too. Craig and I are both very fair skinned and burn easily. We can only assume that Emmett has the same sensitive skin. I don't like to load him up with chemical laden products. Generally we cover him up with light, breathable clothing or outfits with SPF in them. 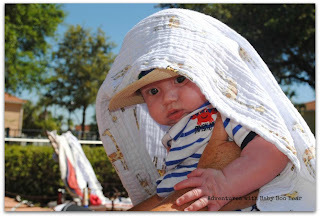 Emmett in Florida hiding from the sun! If clothing or hanging out in the shade are going to cut it we can count on Badger Sunscreen as a safe, natural option. Fortunately we haven't had to deal with these yet! We are going camping in a few short weeks and I know we will have bug encounters. My plan of attack is to research natural, baby safe bug spray options and homeopathic remedies if they end up being required. Yes, I am a mother to a boy. Dirt is inevitable....that's my advice to myself. 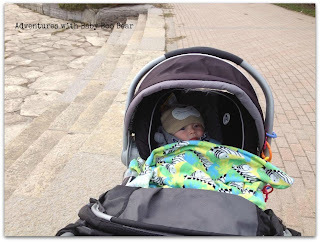 Stay tuned for Part II of the adventure of my favorite outdoor activities with baby!